Hi y’all! I’m Ashley, the founder of Cream Of The Crop Crochet, and welcome to my little place in this big world. When I was little I wasn’t very good at crafts, so I didn’t craft much. I preferred to stand back in awe, watching everyone else. Then when I was about 15, waiting for my mother to leave her crafting group, that’s when I spotted the crochet hooks and yarn she had in her bag, and asked her to teach me. I crocheted for a while then lost interest. Finally, I decided it was about time I pick up the hook again or forget it. Well, I think you can figure out what I decided. 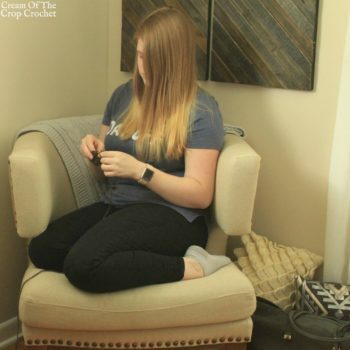 A couple years later, I started Cream Of The Crop Crochet (named by my mother) to share my designing journey with y’all. Along the way, y’all have never stopped surprising me with your interest. There have been some ups and downs on this journey, although that is always part of the fun adventure! One of the best parts of this journey; I’ve met some pretty amazing people and worked with some really great companies. They’ve helped and supported me all the way. If it weren’t for them, I wouldn’t have learned so much and made it this far. Y’all can meet some of them in my Meet & Greets. Now I’m a 20 something year old and always have a huge stack of projects, along with a long list of projects-to-be. In early 2018 with bittersweet feelings, I left Cream Of The Crop Crochet to pursue other opportunities. Brittany Lynch of Ideal Me, took over the operation of the site. Her experience leads me to believe the site is being left in very capable hands and viewers will still have a great experience. Ideal Me is a fantastic site that helps you design and live your ideal life. Brittany will make sure Cream Of The Crop Crochet lives on with patterns, tutorials and resources for y’all! If y’all could give Brittany a warm welcome, I’ll let Brittany take over from here. It’s been a pleasure to operate Cream Of The Crop Crochet, and interact with so many wonderful people along the way.